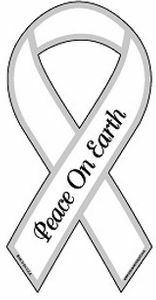 This is the large version of our Peace on Earth ribbon magnet. White ribbon with black lettering that reads "Peace on Earth". Great for your car, home, fundraiser or office!